ActivePure is based on technology originally developed by NASA. It is proven to reduce up to 99% of surface micro-organisms and dramatically reduce airborne contaminants and allergens. Today, the technology is available to consumers, promoting healthier lives through its Beyond by Aerus family of products featuring ActivePure Certified Space Technology. Dallas, TX, April 6, 2017 — Aerus LLC, the Healthy Home leader committed to providing cutting-edge technologies to create the healthiest homes around the world, is honored to announce the induction of its proprietary ActivePure Technology into the Space Technology Hall of Fame, a Space Foundation program aiming to increase public awareness of the benefits of space exploration and encouraging further innovation of NASA-adapted technologies to improve the quality of life for humanity. 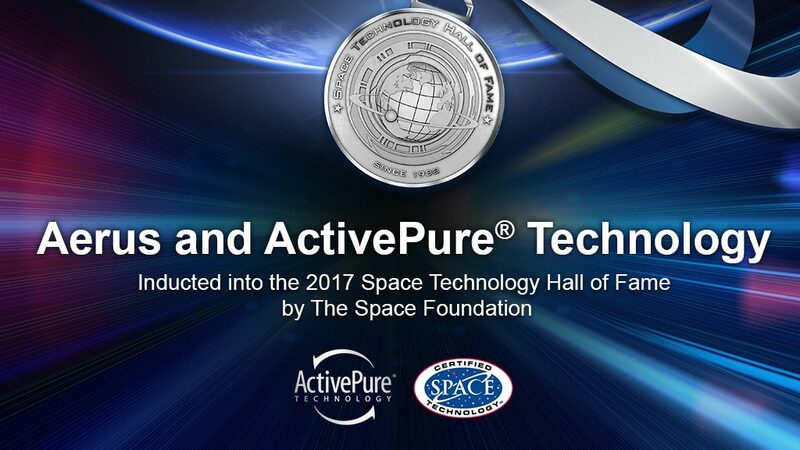 ActivePure Technology is one of only 75 technologies that have been inducted into the Space Technology Hall of Fame in the past 30 years. Past inductees have included energy-saving technologies, satellite and telecommunication technologies, practical commercial devices and health improvement technologies, including LASIK eye surgery, implantable pacemakers and hearing aids and many other devices that improve the quality of life for millions of people every day. The induction ceremony takes place on April 6 in Colorado Springs, as the culminating event of the 33rd Space Symposium, a three-day conference attended by over 11,000 space leaders from around the world. The Space Technology Hall of Fame Dinner honoring the 2017 inductees will be co-sponsored by SpaceX, a space exploration company founded in 2002 by Elon Musk. ActivePure Radiant Catalytic Ionization (RCI) Technology was initially developed by NASA scientists to eliminate ethylene gas onboard the International Space Station and has been adapted and enhanced by Aerus to benefit people all around the world. Beyond by Aerus’ ActivePure Technology has been tested in both university and laboratory environments, and also been used in numerous commercial and industrial settings that face particular high-risk issues. ActivePure Technology is engineered to eliminate contaminants in the air and on surfaces and is currently used in homes, offices, hospitals, daycares, hotels and professional sports facilities. It is proven to destroy airborne and surface viruses, mold, fungus, volatile organic compounds, and bacteria such as MRSA, E-coli and Staph. Since 1924, Aerus LLC (formerly Electrolux USA) has been the Healthy Home leader committed to providing cutting-edge technologies and unparalleled service to create the healthiest homes and living environments in North America and in 70 countries around the world. The Aerus family of companies includes Aerus, Beyond by Aerus, Vollara, ActivTek, and AirScrubber Plus. They are the exclusive worldwide owners of ActivePure Technology, the most powerful air and surface purification technology ever discovered, and the only one in its class recognized by the Space Foundation as Certified Space Technology. ActivePure Technology has been engineered by Aerus based on technology originally developed by NASA.